(CBS/AP) NEWPORT, Vt. - Roger Pion, a Vermont man who authorities say was angry over an arrest and used his tractor to drive over seven police vehicles on Thursday, is expected in court today. According to police, Pion, 34, was on a big farm tractor, angry about his arrest for resisting arrest and marijuana possession last month, when he was rolling across their vehicles - five marked cruisers, one unmarked car and a transport van. Orleans County sheriff's deputies working inside their building on Thursday didn't know what was happening until a neighbor called 911. They didn't hear the ruckus outside because their air conditioners were humming. When police ran outside, the tractor was already down the driveway and out onto the road. Police said they couldn't pursue the man because their cars were crushed. "We had nothing to pursue him with," said Chief Deputy Philip Brooks. Newport city police caught up with Pion a short distance away on Thursday afternoon. Pion now faces numerous charges including several counts of felony unlawful mischief and one count of aggravated assault on a law enforcement officer. He is being held at the Northern State Correctional Center in Newport on $15,000 bail and is expected to appear in court Friday. 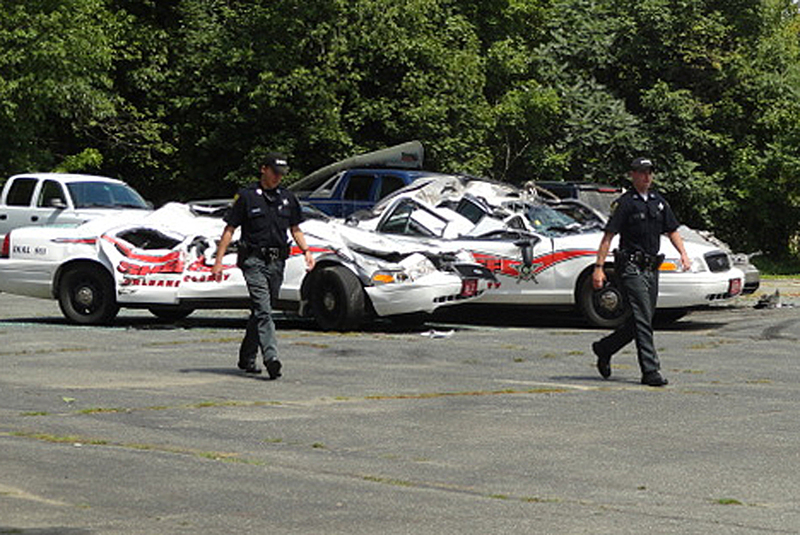 Sheriff Kirk Martin estimated damage to the vehicles at more than $300,000; state police put it at more than $250,000. But no one suffered injuries. "Nobody was hurt. That's the thing everybody's got to cherish," said Martin.